“This is how we Dew the Lake!” That’s the theme of the new Lake Race 2013 on Missouri’s Lake of the Ozarks. 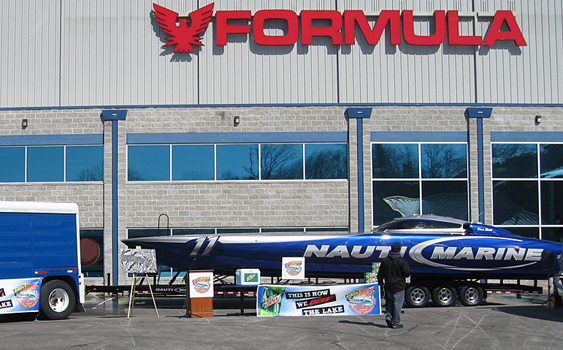 It was announced last week during a press conference to recognize the event’s title sponsors, Mountain Dew and Formula Boats of Missouri. World champion offshore racer David Scott, who calls the lake his home away from home, was on hand at the Formula Boats dealer to show his support for the first Lake of the Ozarks invitational powerboat race, which takes place June 6-9 on the northeast portion of the lake near Bagnell Dam and the Lake Ozark Strip. Scott, who has been selected honorary chairperson of Lake Race 2013, was grateful to be asked to participate in the first-year event. 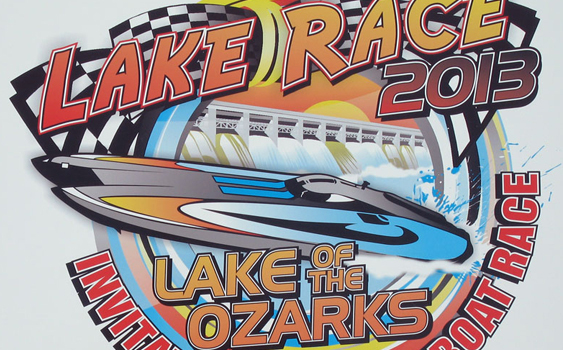 World champion offshore racer David Scott is the honorary chairperson of Lake Race 2013, which is set to take place June 6-9 on Missouri’s Lake of the Ozarks. Lake Ozark Mayor Johnnie Fransezkos agreed. “This is one of the biggest events in our city’s history, and we are very excited that it will be free to the public,” the mayor exclaimed. The Bagnell Dam Strip Association (BDSA), a not-for-profit organization, is the organizing entity for the charitable event, which will feature great views of the race from several points on the lake as well as the race pits and a vendor village along the historic strip. The race also will be streamed live online and feature nearly 10 hours of coverage on local television. 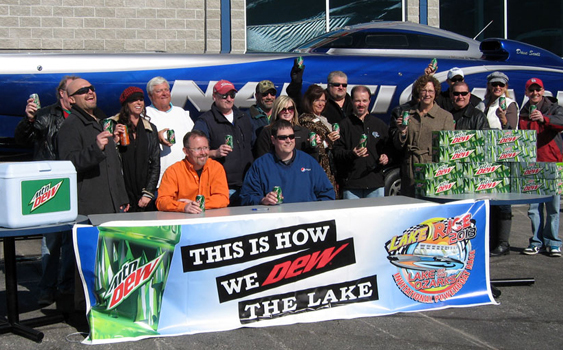 The Lake Race 2013 committee holds up their Mountain Dews at a recent press conference announcing the event’s title sponsors—Mountain Dew and Formula Boats of Missouri. Longtime offshore racer Alvin Heathman is the race committee member tasked with bringing the teams to Missouri for a race that is just three months away. He’s hoping a $40,000 purse will entice many high-profile teams in the event’s run-what-you-brung class—Performance Xtreme (PX), a canopy class with unlimited power. 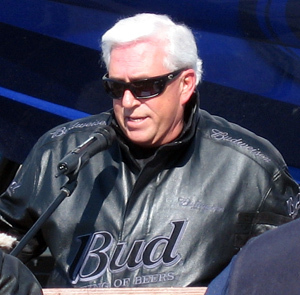 Heathman, who said Performance Boat Center is sponsoring a Super Vee Lite class prize purse, is working on sponsor packages for the five Pro-Am classes as well as the Super Stock classes, but he said the best reason for teams to show up is the fact that there are no entry or registration fees. 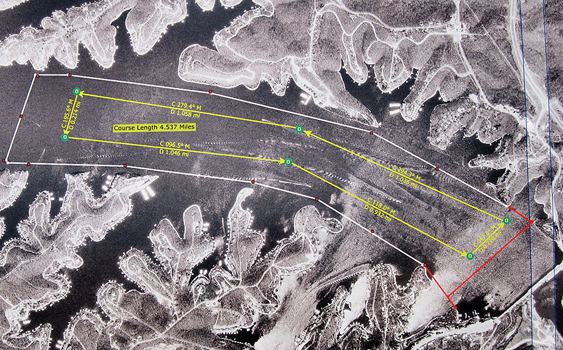 Located on the northeast part of the lake, the racecourse includes two turns in front of Bagnell Dam, which be shut down for spectators. Heathman said the event also is offering a pontoon class—now that’s something you don’t see every day—or ever. The class will feature tri-toon-style boats in the 25- to 28-foot range with a single outboard (max. 350 hp). Scott said he’s excited to see the pontoon races because the boats are incredibly popular on the lake, but don’t expect to see his 50-foot Mystic Powerboats catamaran Nauti-Marine in the race. The stage is set for Lake Race 2013, the Lake of the Ozarks powerboat invitational race featuring a $40,000 purse for the PX class. Here’s a breakdown of the boat classes: Performance Xtreme, canopy/unlimited; Pro-Am 1, 117-mph top speed; Pro-Am 2, 105 mph; Pro-Am 3, 95 mph; Pro-Am 4, 85 mph; Pro-Am 5, 75 mph; Super Vee Lite, canopy V-bottom; Super Stock, twin outboard cat; Pontoon, 25- to 28-foot tri-toons with single outboard (maximum 350 hp). Obviously the committee is hard at work lining up sponsors, donations and volunteers. A portion of the event proceeds will be donated to local charities and beautification projects on the historic Bagnell Dam Strip. If you’re interested in sponsoring, participating or reserving a spot at the vendor village contact Shepherd at [email protected] or 573-434-0611.